Obama makes the Peace Prize into a joke. As we've observed before, the so-called Nobel "Peace" Prize has been making a mockery of its founder's intentions for lo these many decades. Any prize which can be awarded with a straight face to such terrorists, thieves, and fraudsters as Yasser Arafat, Kofi Annan, and Al Gore is, let us say, tarnished at best. Until today, though, the Prize was reserved for people who had actually done something. Like them or not, nobody can deny that Arafat, Annan, and Gore have had a profound influence on what happened in the world - their influences were mostly bad, but were clearly visible nonetheless. What has Barack Obama accomplished? What has he done? He has been elected President - no mean feat, but somebody accomplishes that every four years, as regular as a calendar can tick. He has given speeches, and speeches, and speeches; but Rush Limbaugh does that at greater length, with more regularity and higher quality, each weekday for three hours and has done so for twenty years running. Who are the people who increased peace and freedom in the last few decades? The top of the list goes to Ronald Reagan, Margaret Thatcher, and Pope John Paul IV, who (even the Russians now admit) brought about the peaceful collapse of Soviet totalitarian communism and freed Eastern Europe from its occupying grip. Few greater accomplishments can be found in the history of any time. Less successfully, there are the heroes of Tiananmen Square, the various "color" revolutions of the Caucasus, and even the youth of Iran who shouted, marched, bled and died in an attempt to win their liberty from the evil Islamist mullahcracy that oppresses that unhappy land. Did any of these worthies receive a Nobel gong? No. Most of the time, true bringers of or fighters for peace and freedom are precisely those who not only don't get honored with a Norwegian gold medal, but would never even be considered. The Nobel Peace Prize occasionally goes to someone deserving - nobody would question the meritoriousness of South Africa's Nelson Mandela or Burma's Aung San Suu Kyi, much less of Mother Teresa or the Dalai Lama. At least you'd think not: as it happens, Obama is the first president to refuse to meet with the Lama. If anything, what little Mr. Obama has done has squelched democracy, freedom and peace. He left the Iranian protesters twisting in the wind, writhing in torture chambers, and dangling on scaffolds; he sided with a would-be dictator in Honduras against the requirements of that country's own Constitution, the legal rulings of its Constitutional Court, and the democratically-expressed wishes of its legislature; and, if wars and imprisoned terrorists bother you, he has neither left Afghanistan nor closed Guantanamo Bay (though he may well end up doing both, in time). About the only peace summit Mr. Obama has put together was the one where the professor and the cop joined him for a beer and that conference was meant to heal discord of his own making. No, the Nobel laurels have degenerated to a highfalutin occasion for leftists to honor leftists for being leftists, actual accomplishment no longer required. We can't help but be reminded of the Emperor Nero who did the rounds of the Olympic and other Greek games, carting home 1800 prizes including ones for events which he failed even to complete. When you're a god, it's the thought that counts; the actual score is an irrelevant detail. 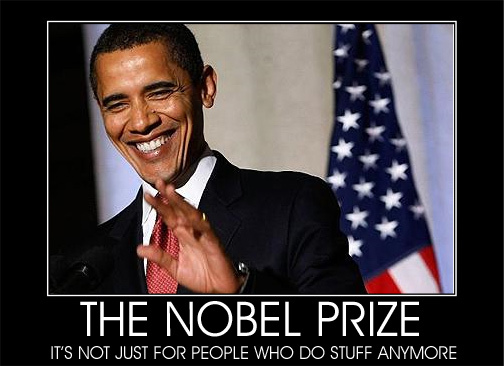 Speaking of which, as ludicrous as Mr. Obama receiving the award a mere nine months into his presidency seems, the rules and deadlines of the Nobel Committee make it clear that he was nominated for the prize no later than ten days after inauguration. Ten days that shook the world! No neophyte ruler in all of history has done more than Mr. Obama must have done in those ten days to persuade the international Great and Good of his transcendent worthiness! Or maybe they just felt bad for not giving him the Olympics and didn't want to be sued for racial dicrimination. The prize risks looking preposterous in its claims, patronising in its intentions and demeaning in its attempt to build up a man who has barely begun his period in office, let alone achieved any tangible outcome for peace... It is certainly true that his energy and aspirations have dazzled many of his supporters. Sadly, it seems they have so bedazzled the Norwegians that they can no longer separate hopes from achievement. The achievements of all previous winners have been diminished. "When you're a god, it's the thought that counts; the actual score is an irrelevant detail"
Rush had a profound take - the Europeans did this to set up a momentum for Obama to withdraw troops, back down from Iran and get rid American nukes. Think about it... How do you accept a Nobel PEACE Prize and then turn around and put 40,000 more troops into Afghanistan? Well, seeing that Obama has not missed an opportunity to slap Europe in the face since his election - heh, maybe the Peace Prize will ENSURE that he sends more troops to Afghanistan. It's not like most of western Europe (England aside) is willing or able to make much of a contribution, even when he asked them nicely. I've been waiting with baited breath for Petrarch's take on the latest Nobel farce. For - let us agree - although it may just be the most ludricrous, it certainly isn't their first. Although Petrarch's elegant turn of phrase never fails to appeal, when I think of Barack Hussein Obama's gall at even accepting this travesty (and, in so doing, demeaning the achievements of a few of those who actually did something to earn the prize), I am nevertheless saddened when I see how low an empire has fallen. Now that America has officially relegated itself to ridicule and insignificance, who will be the next to rise up? And will they be so beneficial as America - for all its many faults - has been? I fear not. And I speak as a Latin American who sees the rise of such buffoons as Chavez, fostered and financed in his totalitarian wet-dreams by the very defenders of democracy. I lament the loss to the world of a mighty and, generally, benevolent regime. May we be so lucky as to see another such arise out of the ashes. Ian, in my own personal opinion, the Brits actually did a better job of running the world than we have, because they were willing to admit that they WERE, in fact, running the world, and actually tried to think through how best that might be done. The US has tried to accomplish the job while not actually admitting that's what we're doing, even to ourselves; that tends not to work so well for the long term. It looks like China will be next up at bat, though I doubt they'll stride the entire globe like America and England before us. We're in for a new era of great-power politics. Regarding Britain, I can't say I disagree with you, Petrarch. Although shouldering the "White Man's Burden" pretty well bankrupted them in the long run. So perhaps America was smarter, if less honest. As to China, I wish I could disagree, and that I had cogent arguments for doing so. Nevertheless, to every cloud a silver lining and so on, for happily the Maoist ideology lingers on only in lip-service paid to a saftely embalmed prophet. 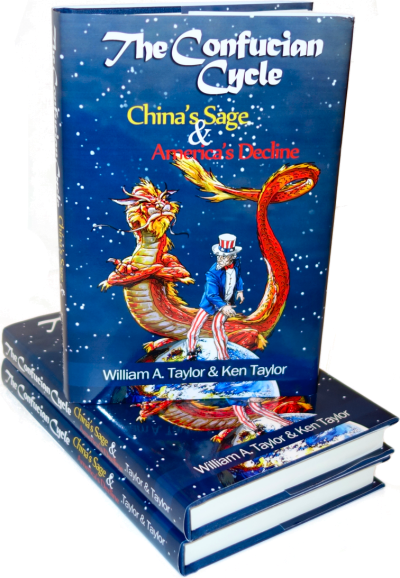 We should count our blessings in being delivered from a China with the economical might of today, and the ideological conviction of yesteryear. At least cutthroat capitalistic motivation is predictable! Ah yes, the Mantle of Reagan. One of my favorite articles. We're still looking for someone worthy to pick it up and put it on. It may be a while, but someone surely will.